This is going to be a super short blogpost. 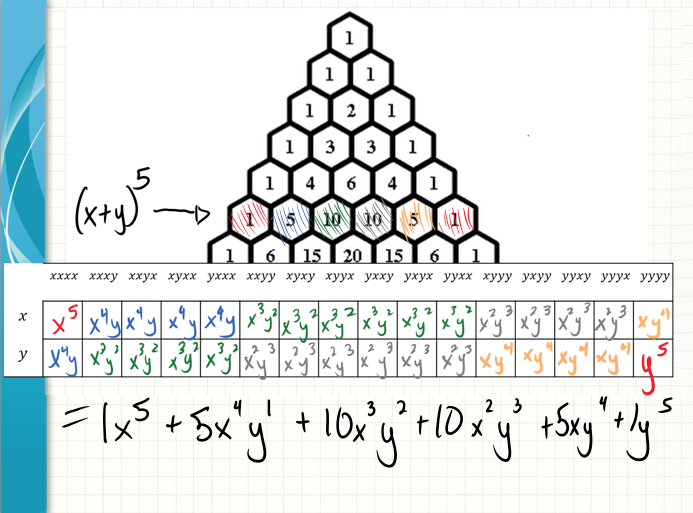 But I’m excited about a visualization I came up with today — as I was working on a lesson — for showing why Pascal’s Triangle works the way it does with binomial expansions. I am thinking how powerful a gif this would be. Start out with 1. Have two arrows emanate from that 1 (one arrow saying times x and one arrow saying times y) and then it generates the next row: 1x 1y. And again, two arrows emanate out of both 1x and the 1y (arrows saying times x and times y). And generating 1x^2 1xy 1xy 1y^2. Then then a “bloop” noise as the like terms combine so we see 1x^2 2xy 1y^2. And this continues for 5 or so rows, as this sinks in. Then at the very end, some light wind chime twinkling music comes up and all the variables disappear (while the coefficients stay the same). Of course good color choices have to be made. Okay, I’m guessing something similar to this already exists. So feel free to just pass that along to me. Now feel free to go back to your regularly scheduled program. Remember when someone named Kate offered a free shirt for a lesson in this area a few years ago? That was kind of my initiation into the whole blogging and twittering thing. I still think I earned the shirt. OMG Do I EVER! Was your idea the Qbert idea? That was GENIUS. And in fact, although we’re not doing Q-bert, that’s essentially a huge part of my approach in this unit. Q-bert was a late entry that beat out my lovely, video recorded lesson. It is easier to do (1 + x), (1 + x)^2 etc. And Pascal’s triangle pops out. Thanks! That is really nice — and I agree! 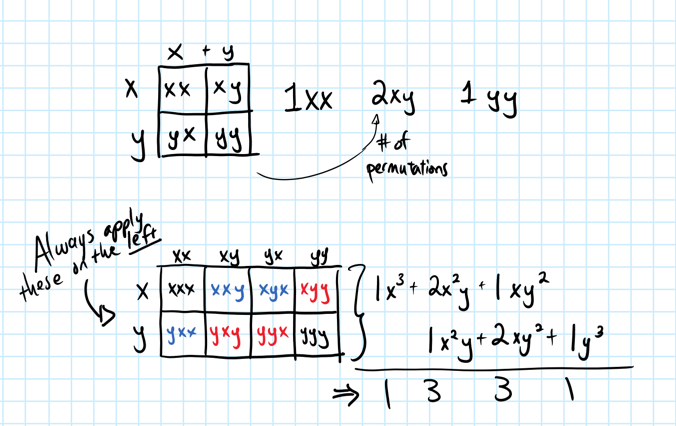 For me, I want to teach kids about the binomial expansion more than pascal, otherwise I would totally do this. Totally! This also jives with combinations 5 choose 2 can mean: you have five slots, choose two of them to be ys. The rest are xs. hihi – believe it or not, that all happens (this whole xxxx and xxxy business) earlier in our lesson. I actually did start with a box model (not exactly like yours, but similar), but for some reason I didn’t think it got across that whole “why do we generate pascal in the way that we do” as easily as this method. The box method shows it works, but it felt a bit hidden to me. I wonder if I have to just think about this a bit more! Thank you for sharing your thinking! 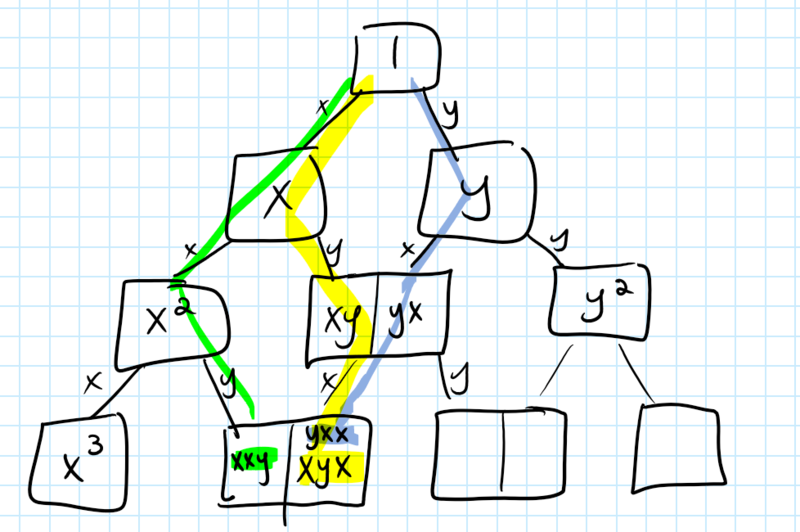 Ah here we go… your way can be a binary tree… branch left is x. branch right for y. If you simplify you get your expressions. If you don’t simplify you can get the permutations. The permutations relate to the path you took to get there from the top, like Plinko! I took your arrow tree and made it into floating boxes. For all boxes on the edge, they’re 1 wide. But for any interior boxes they could have come from upper left or upper right, so they are a 2 wide box. This can represent your duplication of the expressions. 3x^2 will be copied twice into the next row of the triangle: once to the left with an x, once to the right with a y. Love this so much. It does highlight the best of both worlds! It is definitely an improvement! Thank you for thinking about this! Was just doing this with my kids yesterday, and as Scott mentioned, if you use the simplified result of each line with the area (i.e. box, i.e. rectangle) model as the input for the next row, you very clearly see that you end up adding the row to itself shifted by one, which in turn makes it pretty obvious why pascal’s triangle works. I’d animate it up on a web page, but I’m tired, and I’d rather do an interactive thing for scientific notation. Hihi! I actually used to do that whole “shifting a row” in years past. I just never felt totally satisfied with that, nor the box model (which is essentially the same thing). I guess why I was so excited by this approach is that it physically generates the triangle in a way that makes a ton of sense to me. And preserves the “triangle-ness.” But I recognize that what I have above is the exact same thing as shifting the row over and adding. Geeking out with you! Just copied the link to you blog post into my lesson folder! :):) I wish I had time to blog about this entire combinatorics unit. It has totally shifted how I think about combinatorics. So cool. Hopefully I’ll get to it soon.